The XL4 2nd stage provides clean, easy breathing in a compact, lightweight package. Thanks to it’s low weight and ergonomic comfo-bite mouthpiece the XL4 reduces jaw fatigue ensuring its incredibly comfortable to dive with, even on long dives. The XL4 provides clean, clear breathing even as your remaining air gets low, thanks to it’s balanced design. The XL4 is designed to function in cold water. The composite body helps to increase the air temperature entering your mouth for more comfortable breathing. 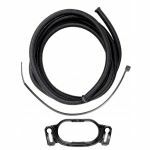 It’s flexible nylon braided hose is exceptionally tough and ensures improved cold water performance. Ensuring the XL4’s compatibility, it features an ‘ease-of-breathing’ Venturi lever allowing you to control the flow of air when using over-balanced 1st stages. This switch also allows you to cut of the free flow of air ensuring you don’t waste oxygen while at the surface. Compact & Lightweight - The XL4 is light and compact. This reduces fatigue on your mouth ensuring it’s comfortable during long dives. Comfo-Bite Mouthpiece - Comfo-Bite Mouthpieces feature a bridge that sits across your palate preventing it from drying out. It also provides further support for the 2nd stage, reducing fatigue on your mouth. Reusable Mouthpiece Clip - The mouthpiece clip is reusable so you can quickly replace your mouthpiece at the dive site. Large Purge Button - The large over-moulded self-flushing and controllable purge button is tough and easy to use. Pneumatically Balanced Design - When air gets low, more basic designs cause breathing to become more difficult. Enjoy clean and consistent breathing throughout your entire dive with the XL4’s pneumatically balanced design. Ease-of Breathing Switch - The XL4 2nd stage features a venturi switch. This ‘ease-of-breathing’ switch allows you to control the free flow of air. Reduce the free flow when you’re not using the 2nd stage so you don’t waste air or increase the flow of air when using an overbalanced 1st stage or your supply of air becomes difficult. Flexible Nylon Braided Hose - Tough and more flexible than standard rubber hoses, Nylon braided hoses allow for improved flow of air as the air pressure increases in deeper water. Clearing Exhaust - A flexible rubber exhaust rapidly clears bubbles away from your vision. Who is the Apeks XL4 2nd stage For? If you’re looking for your next do-it-all workhorse 2nd stage the XL4 should be on your shortlist. Built handle ice cold water it’s equally at home in UK waters as it is in anywhere in the world thanks to its light and compact construction. 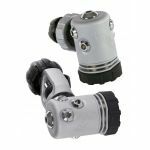 If you’re a beginner looking for your first ‘proper’ regulator or an experienced divers looking for a no-frills, heavy duty regulator. The XL4 is the choice for you. It’s tough, well-made and high-performing.